Want to go paintballing in Warrington with your buddies? 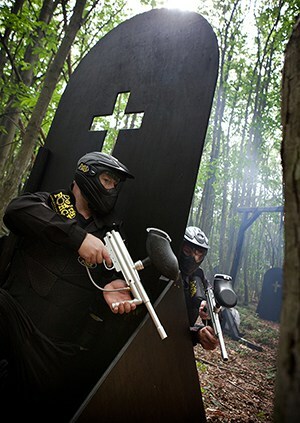 Then book a day of action-packed fun at Delta Force Paintball Manchester! Located just off Junction 17 of the M6, our centre based in Cheshire provides customers with an awesome paintballing experience they’ll never forget! The paintball centre near Warrington offers visitors a variety of thrilling game scenarios including Command Post which is set in the deserted hills of Afghanistan, Chemical Alley where your mission is to take over a heavily protected fuel depot, A Bridge Too Far where allied forces have positioned a number of paratroopers in the Netherlands, Mad Murphy’s Jungle Attack which is set deep in the rainforest, Viet Cong Village which is home to lots of hostile villagers and The Haunted Graveyard where there’s an old church and creepy looking tombstones for players to hide behind. There’s a game zone to suit all paintball enthusiasts in Warrington! 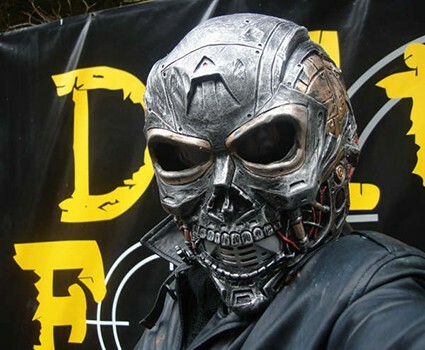 Another danger that prowls the woods is the Delta Force Paintball Terminator ! The rogue cybernetic assassin is armed with two lethal BT4 combat paintball machine guns and can appear in any game at any moment, looking for a worthy opponent! If the Terminator decides he wants to fight you, he’ll raise his guns and point them right at you. You’re then left with two options: you can either ignore him and hope that he challenges someone else or you can open fire and take him on head to head! If you do well and the Terminator feels you’re a worthy foe, he’ll surrender one of his paintball guns for you to use for the rest of the game. It’s the only way you’ll be able to get your hands on one of the Terminator’s impressive markers! The 0.68 calibre semi-automatic machine guns have a light-weight frame and can fire up to 13 paintballs per second! These guns can really give you the advantage during a paintball game, so make sure your eyes peeled for the Delta Force Terminator!